Finland is home to some of the most untouched outdoors in Europe - the perfect place to go and spend some quality time with friends or family. If you've got a few friends looking at a Finland Group Travel, book it. Everyone who visits loves Finland, and your group will have plenty of places to explore and make the memories you'll be talking about for years to come. Since Finland offers so many opportunities for indoor and outdoor activities, you might be worried about getting stuck doing the same things as everyone else. The truth is that the happiest groups plan their trips to have certain days or times where everyone is together, and then leave large blocks of time or even entire days where individuals can go off and do their own exploring without any worry about missing out on the group action. That way everyone feels like they had the perfect trip. Finding the right travel expert to work with you on your Finland group travel itinerary is difficult but important. Firsthand experience about the destination is important, but more important is experience with groups traveling in Finland. The more details you can iron out beforehand, the less hassle your trip itself will be. With the vast majority of Finland's population residing in its southern regions, it is no surprise that many of its best historic and cultural sights can also be found there. This itinerary was designed to show you a glimpse of Finland's past and present in just four nights. If your group has always dreamt of traveling to Finland, choose this itinerary for a relaxing, interesting dose of Nordic charm! 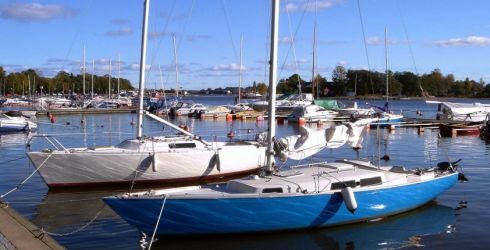 Visit the "Church of the Rock"
View the complete day to day Discovering the Culture of Southern Finland Itinerary. Treat yourself to a relaxing yet fascinating trip to Scandinavia's dazzling capital cities. You will be amazed at how very much one can see in just eight days! Guided sightseeing tours are included in Copenhagen, Oslo, Stockholm and Helsinki, but there is also free time built in the schedule for you and your fellow travelers to explore on your own. Excellent overnight cruises make for a truly convenient and comfortable way of exploring these historic cities. If you have always dreamt of visiting a Nordic world of scenic waterways, Viking heritage, Norse sagas, royal palaces and incredible architecture, this is the itinerary for you! View the complete day to day Copenhagen, Oslo, Stockholm and Helsinki Itinerary.